These are a delicious snack, and I love that they are made with whole grains – so a tiny bit healthier than your usual chips. A great flavour! I have only just discovered Grain Waves. All of this time I could have been enjoying them. I think they are amazing. This is my new go to snack! My toddler managed to get his hands on some and he is very impressed too. Ingredients list is impressive too. I love Grainwaves and l buy them regularly!its soo tasty and a healthy alternative to regular chips!it’s a healthy snack you’ll want to always have in the pantry! The whole family loves Grainwaves. They are delicious and way better for you than ordinary chips. The sour cream and chives flavour is so yummy. The are very moreish which can be dangerous. Grain Waves are crunchy and full of flavour savoury bites and I love the taste of them. The sour cream and chives flavour is not over powering and has a good coverage on all of the bites. Happy to eat a bowl full of crunchy and tasty Grain Waves. We like these chips. They are not our favourite but are nice for a change. The texture and flavour is good. Disappear quite quickly in our house. We love these and recently had them as nibbles at a party. They disappeared quickly. The flavour is great as not boring and not spicy. Plenty of the flavor on them. Healthier than chips. 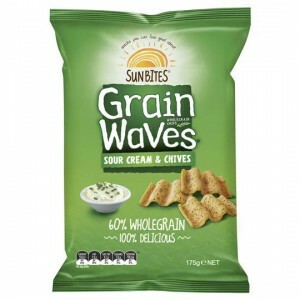 How would you rate Sunbites Grain Waves Sour Cream & Chives?